A robed figure stands alone, his head is hanging low, and his shoulders bear the burden of loss. Before him lies a river, impassable except for a single distant bridge. The bridge leads to the other side on which we can see a castle and green trees & lawn. He however is isolated, surrounded only by 5 cups; 2 upright and 3 that have been knocked over, spilling their contents onto the barren earth he stands on. This is a card of loss, sorrow and isolation. However, all is not lost, there are still 2 upright cups positioned behind the robed figure. Unfortunately he does not seem to notice them as his focus is directed on what he has lost – namely the 3 overturned cups. If only he would lift his head a little from the weight of his sorrow, he would notice the bridge to his right. Being positioned to the right of the traveller we know that it lies in his future, as opposed to the overturned cups that lay to his left and thus in his past. The bridge shows that there is a way out of this pain and suffering. A way to overcome this sense of loss. It offers the robed figure a means by which he can reconnect with the other side, the side where the castle stands, strong and secure. But, in order to do this, he must lift his chin, leave his past behind him, turn to the future and cross the bridge. In life we all have reason and opportunity to occasionally indulge in a bit of self pity, often for a little longer than necessary. 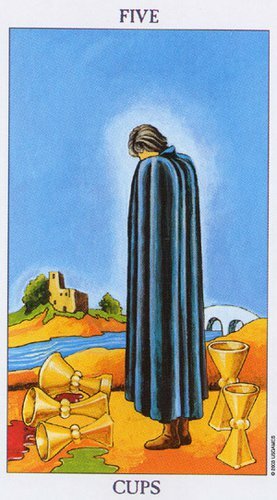 Like the robed figure on the 5 of Cups we too all to often focus only on what was lost on such occasions, and seldom on what might be gained. Yet, sometimes we can change the course of our own future histories, if only we’d consider what may be gained. To get back to the 5 of Cups card, perhaps the gifts of the upright cups that stand unnoticed behind the figure on the card contain the courage and faith needed to take that step away from self-pity & victimhood. What an amazing way to explain this card. It made it accessible to different interpretations that I have had before. Thanks for your feedback Witchbladesa. I am so pleased that my interpretations have opened new and fresh ideas to you.